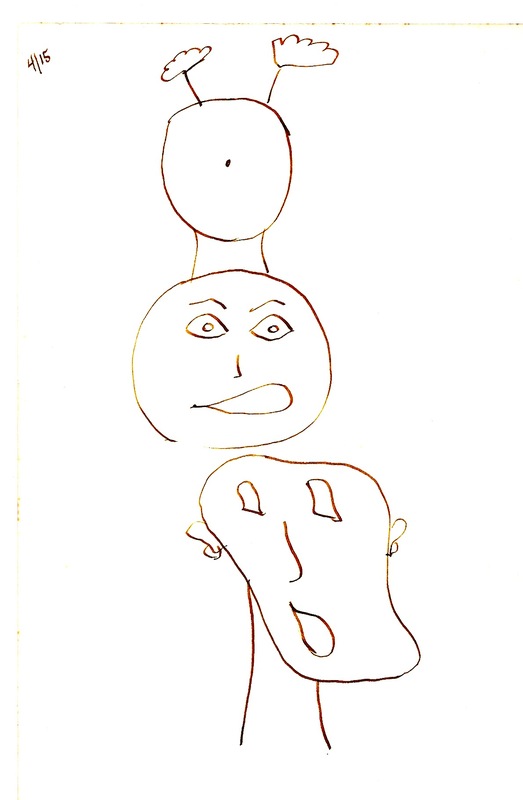 Here are two drawings I made when I was coping with Post-traumatic stress in the mid 1970s. I chose them because they convey some of what I’m feeling these days. Lying in bed at night, awaiting sleep, I am discovering an old breath pattern in which I hold my head and face rigid, especially my jaw. I literally find myself holding my breath. I believe that I learned this body restriction when strapped down for surgery as an infant. As I move to a place of greater agency in my life, I am being shown what is limiting me and what I need to let go of. I am being invited to change my old habits. In my heart, I now know that I am free; it’s just a matter of helping my body and brain to know this, too. In bed at night, saying the affirmation I am safe allows breath into previously off-limits places. I am making progress. In my meditation this morning, I saw two furry animals, one brown and one black. They were young bears, crawling under a chain link fence, flowing like water. I’m getting somewhere. I love how you approach and consider the dual-self here. I’m reminded how much I often forget to be aware of my own selves, one is free and wants to be freer, the other afraid, in pain and frozen. Your picture is just this. One sees with open pupils, the other, pupil-less. I’m also reminded how I forget that these are both sides of myself and both need to be honored. I often push one self away and try and force the other into existence. With your two baby bears working together to fluidly slip though barriers, sounds like you’re making real progress. Both selves need to work in tandem with their own nature and special purpose. I remember now that I can do this, too. Your blogs are like little gifts! And your Comments are “like little gifts.” I don’t know if you know how much it means to me that some of what I’m writing about is useful. Knowing there are readers like you out there helps me share what I’m sharing. It’s a circle that keeps going round. Sometimes I think, oh, I have to lighten up. I guess that’s where the animals–the bears–come in. Recovering from trauma is two-sided. Staying awake and aware is key. And we can support each other in doing this. Interesting. The repetition of mantras, psycho-therapeutic affirmations, and religious benedictions all have calming effects on the human physiology. Perhaps this is a reflexive action when presented with certain types of stress. Actually, for me, it is not reflexive at all. I have to consciously make the decision to think in a new way.